As mentioned earlier, this annual report to the Legislature used to be one of two sources of data concerning local government incentive contributions. This information made it possible to tally the overall government assistance to a MEGA project, not just the value of state-level incentives. The report no longer provides this information, however, and the briefing memoranda (the other traditional source for such data) have become so vague recently that it is nearly impossible to consistently and confidently measure the total costs of a MEGA deal. The richly detailed 1998 edition of the annual report can be seen in its entirety at www.mackinac.org/10795. The summary spreadsheet from that 1998 report is reproduced in Graphic 11 to show the detail once provided by the MEDC in its MEGA annual reports. In contrast, the heart of the 2008 annual report is a limited two-page spreadsheet without narrative. Page One of the 2008 report is reproduced in Graphic 12. The full reports are markedly different. 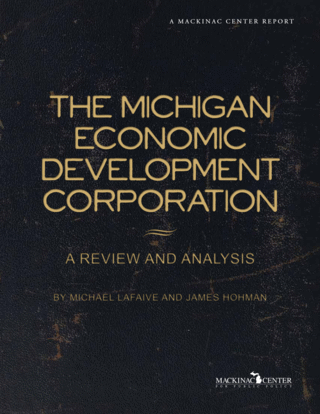 The 1998 edition contains a narrative of the company's history and the MEGA deal; an executive summary of the report; the project location, including the city and county; the location of the company's headquarters; the expected total jobs (both direct and indirect) to be created over the life of the deal; the average weekly wage, including the benefit package value as percent of total; the capital investment expected; the estimated net positive state government revenue impact over the life of the MEGA project, showing both the estimated state revenue forgone and the estimated state revenue gained; the projected state personal income generated over the life of each MEGA deal; and the explicit value of the local government's contribution to the MEGA deal through various local government business incentives. The nine-column 2008 annual report contains only the company name; the company location; the project city; the project county; the company's capital investment; the total years approved (of MEGA credits); the maximum credit authorized; the jobs to be created; and the jobs to be retained. 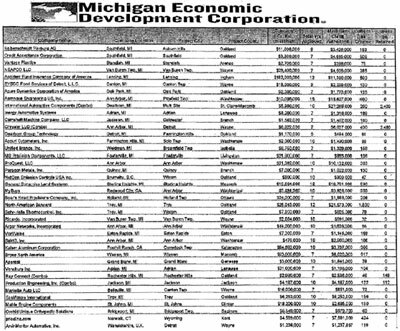 Making matters worse, the columns "of the annual report of the activities of the Michigan Economic Growth Authority to the Michigan Legislature" required by law have actually changed from fiscal 2007 to fiscal 2008, although they were published only six months apart. [†] For instance, the fiscal 2007 report provides the column "Revenue Forgone: (MEGA Costs)," while the fiscal 2008 edition does not have that column. Conversely, the fiscal 2008 report contains several columns that are not found in the 2007 report. For example, the 2008 report contains a column for "Maximum Credit Authorized," a term whose meaning is unclear. The 2008 report also includes a column for "Jobs to be Retained," a term whose meaning seems reasonably clear, but whose purpose is unclear, since this figure did not appear in the 2007 report. Nor was the 2007 report a model of clarity. A reader cannot tell explicitly, for instance, whether the "Revenue Forgone" column in that report is referring to the amount of tax revenue forgone in fiscal 2007 alone, or to a total amount of tax revenue forgone over the life of the MEGA credits, which could be many years into the future. A close inspection suggests it is probably the latter, but if so, legislators should realize that MEGA is providing the same piece of information as "Estimated Credit Amount" in the "All MEGA Projects" spreadsheet, as "Revenue Forgone/(MEGA Cost)" in the fiscal 2007 annual report, and as "Maximum Credit Authorized" in the fiscal 2008 annual report. In other words, like other elements of the report, this column is inconsistent, unclear and unaccompanied by any explanation. In short, the key component of the annual report to the Michigan Legislature raises more questions than it answers. The remainder of the annual report lists little more than the company name and top officers at the firms in question, something that wasn't included in the older reports. This new information is trivial in comparison to the information that has been lost. [*] For example, Michael LaFaive telephoned an MEDC spokesperson on June 1, 2009, and asked if it would be acceptable to submit questions directly to her. He expressed his concern that some of his questions simply could not be answered using the Freedom of Information Act, but could be answered directly and quickly by a spokesperson. (Admittedly, he also harbored concerns that the MEDC might claim the 10 business-day extension allowed under FOIA law and then either send documents too vague to assist him or respond — as frequently occurs — that "no such documents exist.") The spokesperson encouraged him to submit his questions in writing, and he did. "We've had several similarly worded questions and requests come in multiple ports of entry recently from you/your staff and it's caused some confusion as to who's responding, whether they're currently in the FOIA queue or if they've already been handled. We don't' [sic] want to waste your time nor duplicate efforts on our end, so we'll be sorting through these early next week, cross checking for duplicate inquiries, reconciling with pending FOIA requests, etc. and then will get back to you." LaFaive responded the following Tuesday: "I received your Friday e-mail. Naturally, I am a bit disappointed, since my questions were submitted to you on June 1. When might I expect a response this week based on your meeting? Today? Tomorrow?" As of Aug. 28, more than 10 weeks later, the spokesperson had not responded. A larger sample of the correspondence described above appears in "Appendix A: A Sample of Correspondence With the MEDC." [†] There is nothing to indicate in the MEGA annual reports for fiscal 2007 and fiscal 2008 why the 2007 report was issued in April 2008, more than six months after the close of fiscal 2007, while the report for fiscal 2008 was published just one day after the close of fiscal 2008. This disparity meant that the two reports were issued just six months apart.